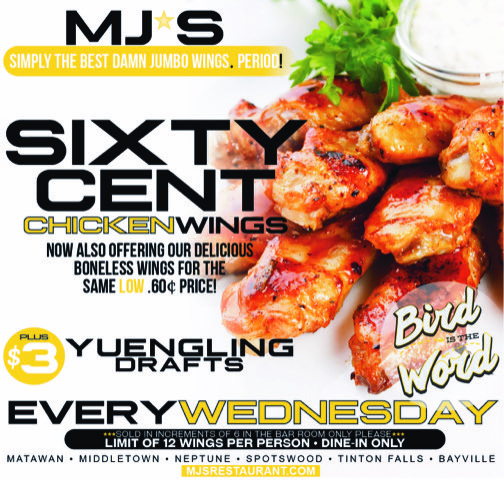 MJ's Pizza Bar & Grill, Matawan : Sixty cent chicken wings every Wednesday! MJ's Pizza Bar & Grill - Sixty cent chicken wings every Wednesday! Every Wednesday at MJ's at Buttonwood Manor, come out and enjoy sixty cent chicken wings! That's right! PLUS, along with the sixty cent wings, get your hands on $3 Yuengling drafts! To view MJ's other locations, click here. To view MJ's full menu for Matawan, click here.